I'm going to wear my new (and super comfortable) James Perse dress a lot this summer. It's super lightweight and goes with so many things in my closet. I need to stock up on dresses like this for our Europe trip! what a cute vest! you look so beautiful! love the big smile! What a great outfit and I absolutely love that jacket from Zara! what a great combination of this gorgeous parka and and this great dress! P.S: It depends on the places that you will visit and the time that you will come in Europe but bare in mind that its cold!! such a great look! your shoes are so fab and go so well with the striped skirt! So jealous you're going to Europe that will be so much fun. I love the vest with the dress you look beautiful. I like your shoes and jewelry a lot! 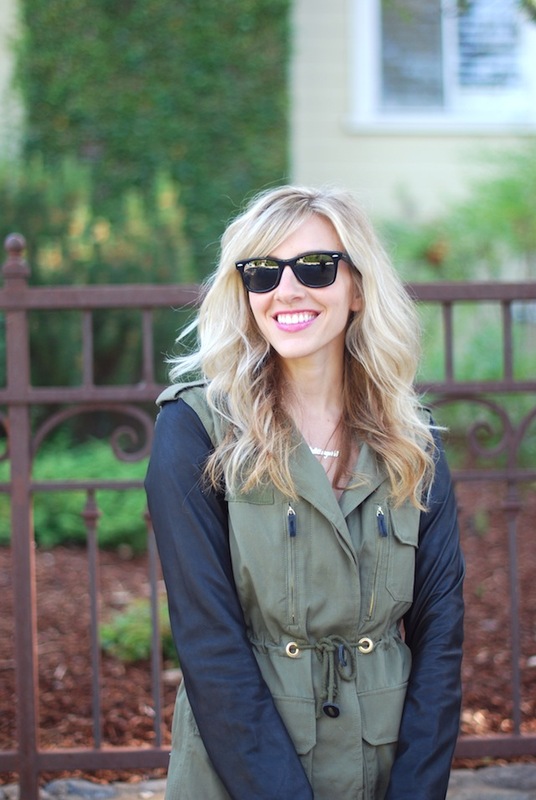 Loving how you styled that dual-toned jacket. So chic! Gorgeous! Your hair looks fab in this post, too! I love your Zara jacket and accessories! You look great! I love the stripes!! I really like the watch, the gold color is absolutely pretty. love this look!!! super cute!! Enter to win an OASAP leopard pleated skirt! you have just the most beautiful hair .. this outfit is wonderful!! Wish I had nabbed that jacket when it was still available online! Love the outfit! Love your dress! James Perse makes SUCH comfortable things!! yes, I also love easy lightweight dresses for summer. so cute! Love this outfit! Especially those RZ wedges & classic wayfarers. Yay for europe! come visit me! You look so pretty :) That dress is great! Bag is gorgeous! I like this combination too. The James Perse dress went beautifully with the Ray Ban sunglasses. There are only a few dresses that go well with Ray Bans but this is one that definitely suits the outfit. I get how you want to wear this attire more often coz I for one loved it even from first glance. I am obsessed with your jacket! I love that cuff! Really, really pretty. Love the jacket!Absolutely great outfit!Love the sunglasses! really loving the layering you have done here! you look great.